"Too late you realize your toddler has found your fully loaded Krup 9000, 16 Shot, Near Silenced, Semi Auto pistol. Sitting at the end of the hall baby is playing with a lethal weapon. Baby is about to have a lot of fun. The dog was the first victim. BABY BOOMER is a solo or group board game that keeps everybody on their toes as they race down the hall to disarm the toddler. Sixsided dice, and Diapers not included." "Geriatric Wars combines the fun of Role Playing with the fast action of a board game. Characters battle over a few pension checks that survive the Social Security collapse of 2018. * Health Insurance has taken your last Dime! * You Live on Social Security! * The check is all that matters. * Cash it or Else!" 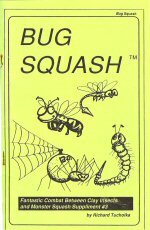 "Bug Squash is a crazy clay combat game between insects that you design! Players craft their bugs and combat to the death. Completely compatable with the other Squash series games by Tri Tac Systems." "It's the end of the century and humanity is no longer the master of the Earth. You are a survivor who is fighting the Duck invaders from another dimension. * Hundreds of Skills & Weapons! * Ducks, Monsters and Furballs! * Complete and Easy Game Systems! * Rules for Extended Campaigns! Tri Tac's Duck Trooper RPG is a complete role-playing game in 64 pages. Polyhedral dice not included. You might take back the planet, if you have the guts." "Before the dawn of recorded history, a race of gentle beings called the Tehrmelern created a vast network of inter-dimensional pathways that spanned both space and time. For a hundred thousand years they travelled and traded these alternate worlds, spreading their love of peace. Then, almost overnight, an unforseen terror ended the Commonwealth of the Tehrmelern, leaving their greatest creation to those who would follow. A Japanese research team investigating the ecological effects of an unusually warm Antarctic summer make a startling discovery that is desined to change man's role across the universes. An alien building they find buried deep in the melting Antarctic ice contains a 25 foot, gleaming silver ring. The party stepped through the center of the ring without harm. They turned and, to their surprise, one of their expedition had vanished without a trace. In a week, Sayuri Tanuma reappeared from the ring with a wondrous story. She told of the other portals, and of the walkways that lead to other worlds, alternate Earths, and to a strange guardian called Schmert who talked in rhyme and gave her a key to the portals. They stared at her is disbelief until she opened her hand and showed them the softly glowing crystal pyramid. Their data, presented to the United Nations, sparked a UN seizure of the first station as a second was discovered in Canada and a third deep in the Soviet Union. Designed by Morrow Project alumni Richard Tucholka, Fringeworthy first appeared in 1982. The staplebound blue book looked deceptively primitive, which belied the sophisticated game universe inside. 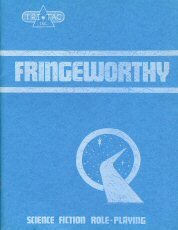 The concept of the Fringe was groundbreaking, and deserved the 1992 revamping which reset the type and covered the softback in striking artwork. The game system was percentile-based, realistic, and a bit over-complicated. The trend in gaming now is for greater simplicity in the rules to allow interruption-free play. This is really no issue as the Fringeworthy background would adapt well to any contemporary game system. The Amazon listing really could be of any printing, though the newer edition would probably be more plentiful. 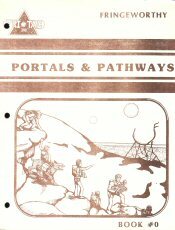 An 8-page supplement -- Portals & Pathways -- was released with the first printing, including rules that didn't make it into the first book. With the US under a harsh Soviet occupation force, you fight back to regain your lost freedom. 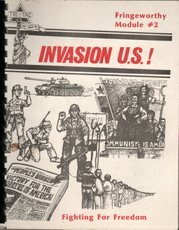 Invasion US is a game module of small group RPG action against a hostile force. Characters will live in the Peoples Republic of America where every movement is watched by the KGB and the slightest slip will send them to prison or death. 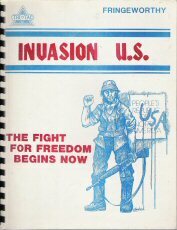 Invasion US is a game system supplement for Stalking the Night Fantastic or Fringeworthy that can become a game in itself with the use of Tri Tac role playing systems. "Journey with the IDA Explorers as they discover strange and alien versions of home where nothing is quite as it seems. 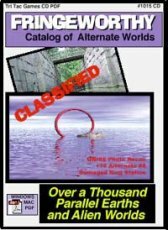 The Catalog of Alternate Earths and Platforms is a compact and comprehensive database styled description of over 400 Parallel Worlds. Over 200 pages and 1800 other earths to explore is this huge collection of places you never knew existed. Adventures/Workds and photographs from places that almost were. Use with Tri Tac's Fringeworthy RPG or any other RPG system that explores Alternate Realities." 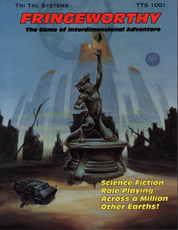 Only available for purchase on PDF from Tri Tac Games. As the flask of Rogue 417 smashed to the lab floor, the technician quickly flooded the area with an antiseptic and called for help. But this was the Middle East, a savage war zone, where special equipment, trained personnel and ultramodern containment technology are often lacking when desperation forces half-trained bio-chemists to create new weapons. 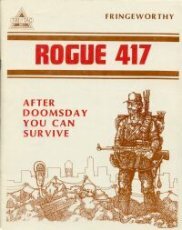 The technician died within hours and Rogue 417 was loose in the world to sythe a path of destruction and madness that was unparalled in history. 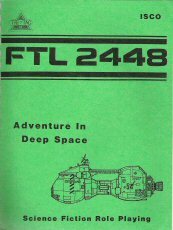 Rogue 417 is a game system suppliment for Fringeworthy or Stalking the Night Fantastic that can become a game in itself with use of Tri Tac role playing systems. With Fringeworthy, Rogue 417 becomes a campaign of Inter-dimensional Explorers and survivors pitted against a madman [the Warlord of West Virginia]. 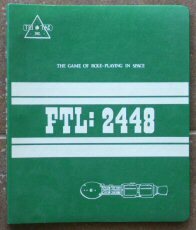 Original FTL 2448 edition came in a custom plastic binder. "Including: * Ship Design * Alien Races * System Generation * and Much More." 1982 ... Richard Tucholka ... 102 pages ... Tri Tac Inc. 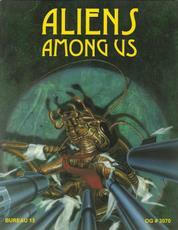 This edition came as 2 seperate paperback books that -- when placed side-by-side -- form a panoramic picture. Excellent reviews -- with different conclusions: Here and on RPGnet. "You are a citizen of the future, space is your home, your neighbors are aliens, and you work between the stars. Yours is the life of a human or alien living in a future where a society travels Faster Than Light. With detailed information for easy to use character generation, 200 +skills, 30 alien races, starships, weapons, vehicles, comprehensive medical and damage systems, equipment, planetary generation, and much much more." 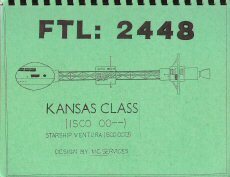 Detailed deck plans of a starship in the FTL: 2448 roleplaying game. You're a Cop on the beat in the inner city, equipped with the best in police weapons, equipment, and high technology. You're a Gang Member in the inner city living without hope as mankind heads for the stars. You defend your home turf from outsiders and alien outcasts that would call it their own. 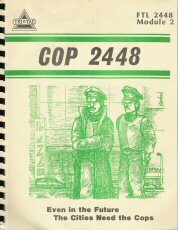 COP 2448 is a suppliment for Tri Tac's Faster Than Light 2448, Fringeworthy, or Stalking the Night Fantastic role playing games. Designed by Branden and Tucholka." 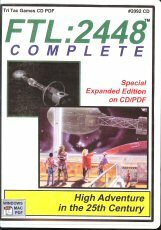 Official CD-ROM compilation of FTL 2448 pdfs released by Tri Tac Games. 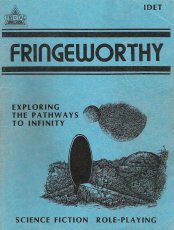 Includes "both 200-page volumes of the 1992 edition as well as never published material, history, and starship blueprints." 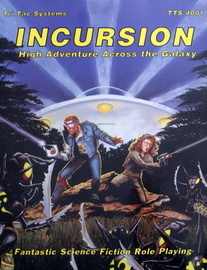 The 1983 orange-cover edition was staple-bound. It was revised in 1984 (plastic comb binding) with the addition of several more pages of rules, with novel page numbering that bypassed the need to completely re-typeset the rules (pages 36 a&b, 38 a&b, 56 a&b, 62 a&b, 84 a&b). The 1990 & 1992 editions were perfect-bound paperbacks. You are an agent of the most secret agency ever created by the US government. 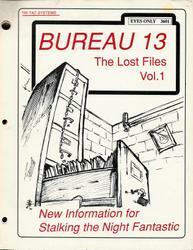 Bureau 13 is an elite group of "Free Agents" who hunt the highly destructive forms of the Supernatural. You are equipped with modern and special equipment, the best in weapons and technology. You are the hunter of evil. You are also the hunted." It's a quiet night in downtown Detroit as the first in a series of strange murders takes place. Bureau 13 is notified and quickly arrives. They think they know the answer as they see the holes in the neck, but it is more, much more than a vampire. 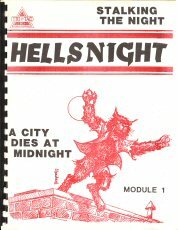 Hellsnight is the first Stalking the Night Fantastic Casebook filled with adventures for hunters of the paraphenomenal. Seven adventures and new information for Agents of Bureau 13 provide many hours of suspense as they stalk the Evil of the 1980's. 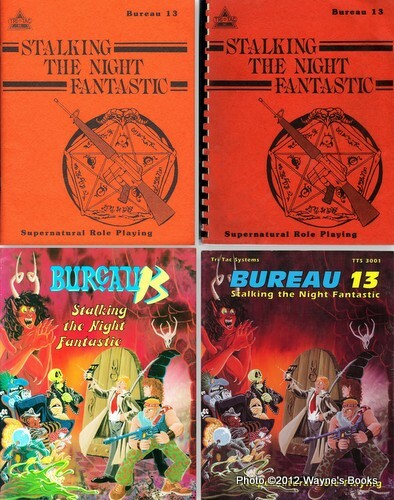 This module requires use of the RPG Stalking the Night Fantastic or Fringeworthy." 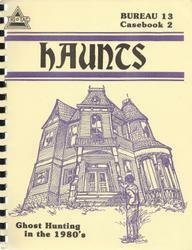 There are two distinct printings of "Haunts" - both are dated 1984, and the interiors are identical, but the covers have different art and graphics. 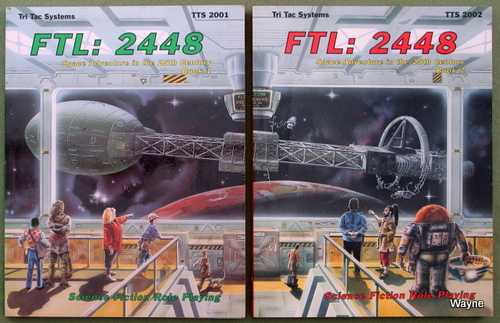 Idetermined that the black-lettered cover version is the later printing, as the company is called "Tri Tac Systems." 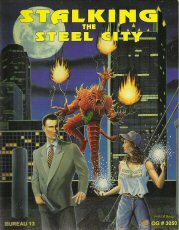 Prior to this, it was named "Tri Tac Inc" and is labeled as such on the earlier, red-lettered cover. Down dark and shuttered halls roam the spirits and inhuman evil of the night. Behind them are the hunters of the paranormal, the agents of Bureau 13 who are Stalking the Night Fantastic. 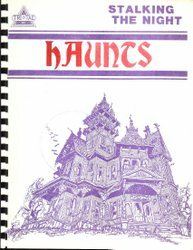 Haunts is the second Stalking the Night Fantastic supplement filled with adventures and new game information to expand your existing campaign. 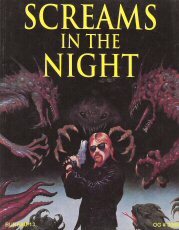 This module requires use of the RPG Stalking the Night Fantastic. EVIL IS WAITING FOR YOU." * Other rare information not generally known. While these records are not by any means complete, they provide the beginning groundwork towards comprehending the risks and dangers of being a member of "The Bureau". This is the first of a series of lost files that will provide an incredible insight into America's Most Secret Government Agency: Bureau 13." "Pittsburgh: Beautiful, modern, nestled in the foothills of the Allegheny Mountains, it has been called the Most Livable City in America. But no one takes this big city that acts like a small town seriously. Evil has come to the Steel City. It's secret places are filled to bursting. * 16 New Special Equipment and Weapons"
Unseen Horrors lurk in the dreamscapes of America. You are Shadow Warriors, our only defense against those who prey from the darkness, shrouded by deception and disbelief. You are the Paladins of the 20th century. Only you can stand in the gap. "They've been here a long, long time. They shook the ground as they walked, and our ancestors called them gods. We look to the stars to find alien life, but they are in our schools, behind the eyes of our children. Sometimes the very air we breathe carries an unearthly intelligence. When we meet them, we are forever changed. If we are lucky they are hapless travellers shipwrecked on our solar shore. Otherwise we are prey. They may make a meal of us, but BUREAU 13 is going to get a sandwich off of them. Eat or be lunch! 7 BUREAU 13 Agency Information Files"
"Long before recorded human history, the Earth was discovered by alien travellers known as the Anshani. Gentle in their ways, and with an incredible level of technology, they expanded their interstellar empire across this Galaxy. Welcoming many into their fellowship, they nonetheless had a few requirements for admission. Upon discovering the Earth, they stationed a Sentinel Drone in the Sol System to protect developing humanity from outside interference, and from the more warlike races who travelled the stars, until Earth was technologically ready for contact. The Anshani held the galaxy in peaceful coexistence for many millinia, and then mysteriously vanished, leaving behind a galaxy in chaos. As interstellar empires rose and fell, humanity developed in a safe harbor in a sea of crumbling interstellar chaos, protected by a sentinel that watched and waited. 1945 AD: When the first nuclear warhead flared into incadescent existence over the New Mexico desert, scientists knew the world had changed, and that a new age had begun. Little did they realize that the Sentinel Drone had detected the detonation and was headed home to tell the Anshani that the Earth was ready to be opened to the Galaxy. NOW: With the Sentinel Drone gone, the Earth was open to alien contact. Earth has been found by pirates who command an ancient Anshani ship with amazing technologies. Realizing they have an untapped treasure trove on Earth, the pirates steal and enslave with every visit. As Mankind nears the 21st Century, Earth inhabitants hardly realize that thousands of people are vanishing every year." 1992 ... 192 pages ... TTS 4001 ... ISBN ? ?